There exist a lot of useful templates on Inventory Management. But what if we want to track our check-in and check-out of borrowed items? The tracking of lend-items is very useful for libraries or schools. 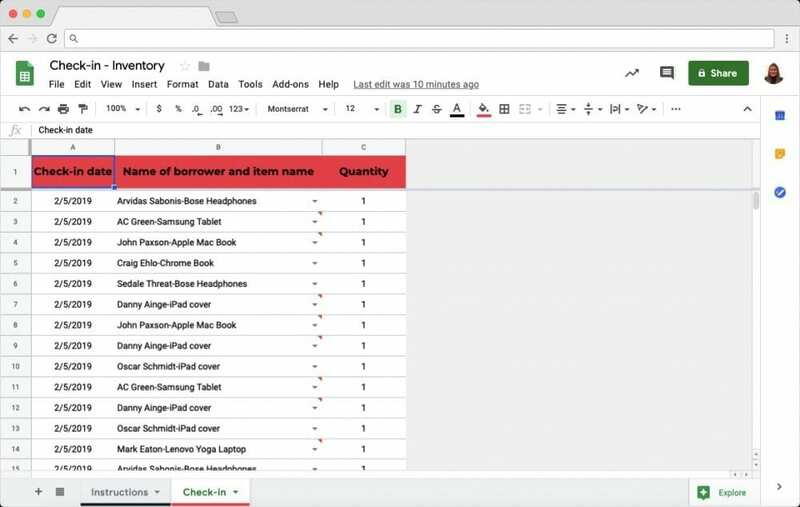 This Inventory lending template in Google Sheets automates the monitoring of your current inventory. 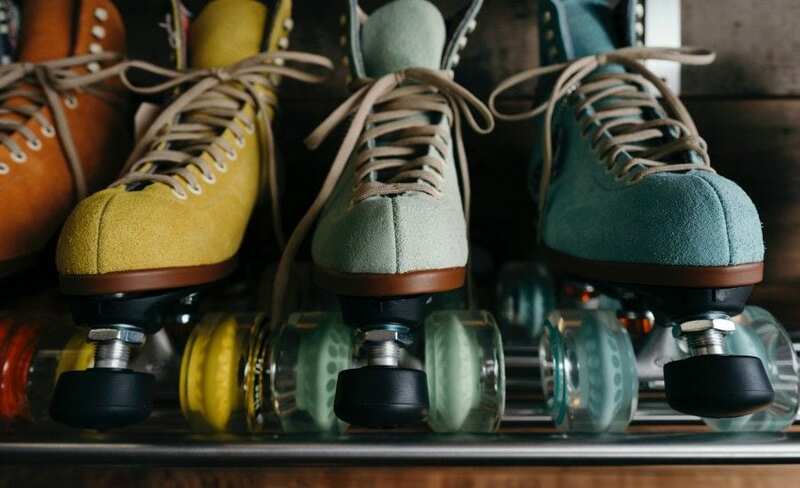 This template consists of two input spreadsheets “Check-in” and “Check-out”, which are connected to the master spreadsheet “Inventory lending (master sheet)”. On each spreadsheet, you can find instructions on how to use them. 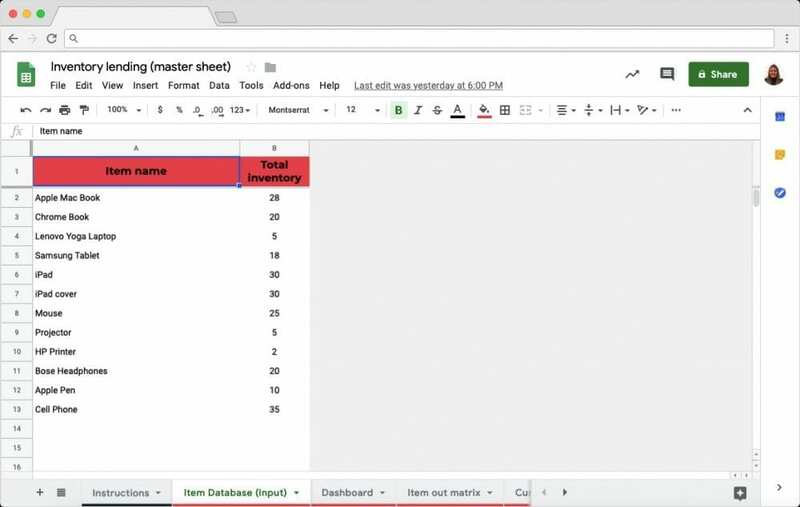 Start by filling out the “Current inventory list” in the master spreadsheet. Once that is done, you can start lending out items and register them in the Check-out. Once a person returns a certain item, register this in the Check-in spreadsheet. 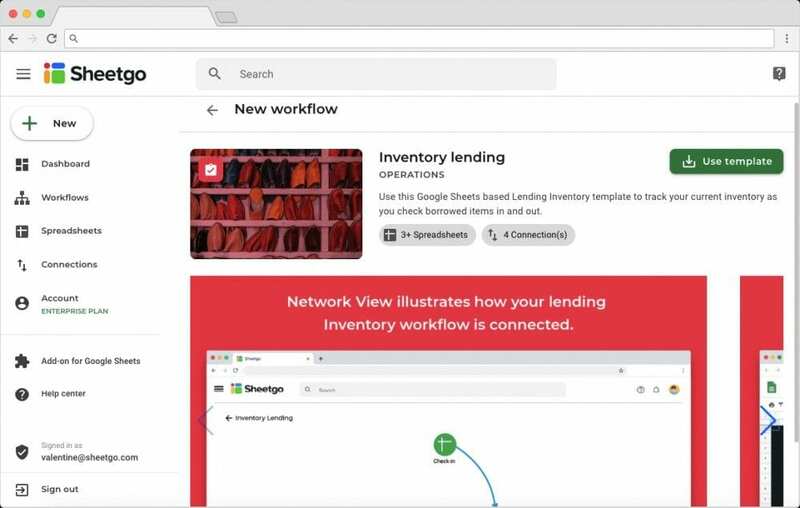 Sheetgo will automatically pull the data from all spreadsheets by using two-way connections and therefore monitor the current inventory of your borrowed items. Click on the button above to install the template. You will be asked to log in with your Google account. After authorizing Sheetgo, your Sheetgo account will also be automatically created. 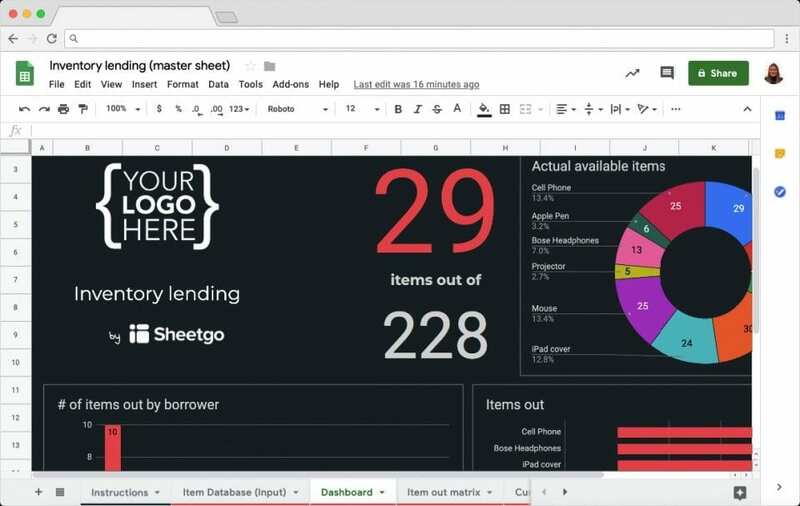 Once you are inside the Sheetgo Web Application, click on ‘Use template’ to install the Inventory lending system. 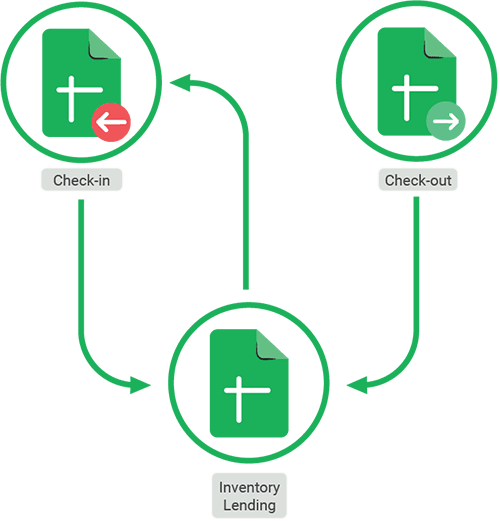 Click on the spreadsheet icons to open both the input spreadsheets “Check-in Inventory” and “Check-out Inventory” and the master spreadsheet “Inventory lending (master sheet)”. These are stored inside a folder in your Google Drive. Inside your master spreadsheet “Inventory lending”, fill out the “Item database (input)” tab. In this tab, you will add all the items you currently have, and all the new items you will acquire over time. Don’t use this tab to register returned items after borrowing it. Inside the input spreadsheets “Check-in Inventory” and “Check-out Inventory”, you will find instructions on how to use the template. Simply fill out the Check-in and Check-out tabs with the date, name of borrower and item name, and quantity. The name of the borrower and item names will automatically be populated from the master spreadsheet. 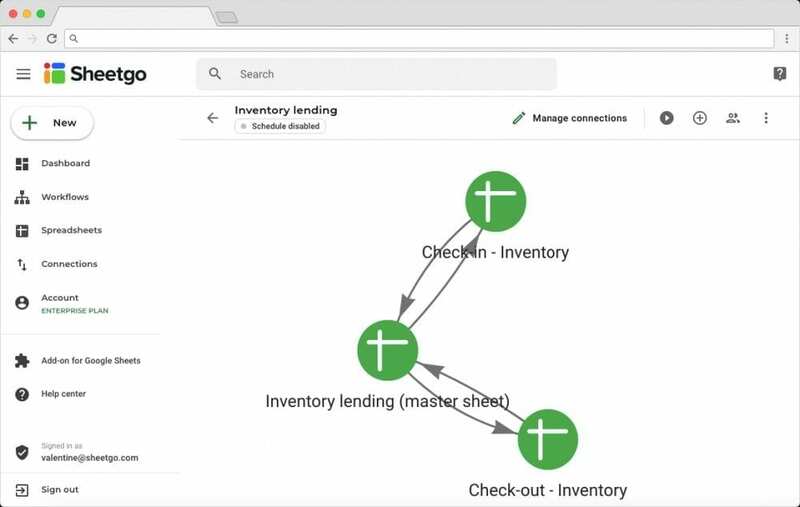 You successfully configured your Inventory lending template in Google Sheets. If you have any questions or remarks on this post, please visit our Sheetgo Community and do not hesitate to contact us there!